Screaming with Laughter – we did, and so will you! Right. Imagine this – an oasis where parents gather, watch upcoming comedians and, get your head around this one, are encouraged to bring their babies. As a matter of fact, not bringing your baby would be considered a rather strange and conspicuous thing to do. All but a dream we hear you say… NEWSFLASH: it’s here, and it’s in the form of ‘Screaming with Laughter’; a place to bring your little ones, watch rib-cracking comedy, and, most importantly, unwind. 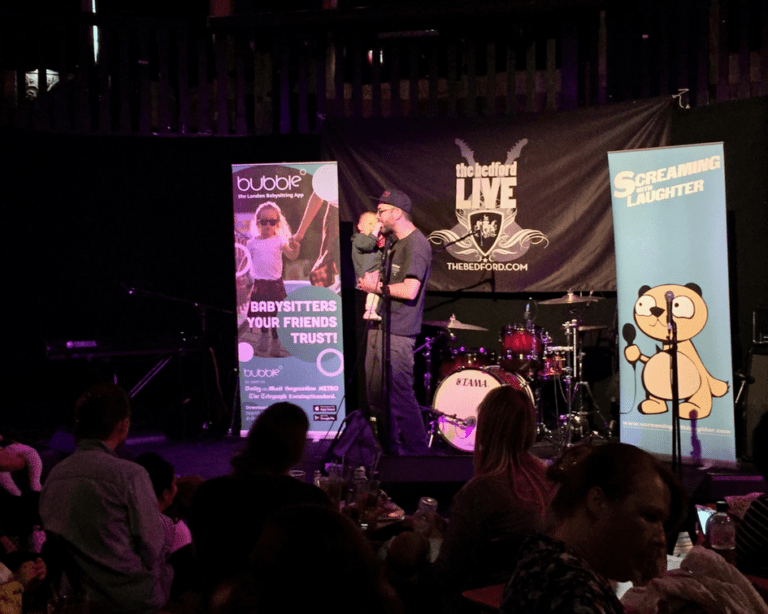 We loved the sound of this idea, decided to sponsor one of their Balham events, and believe us, we were not disappointed. First, let us point out that these shows are popular and unquestionably in demand – with no seat going spare at the Balham venue. Once all prams had been parked, nappies changed, and children rocked to sleep, Hatty Ashdown emphatically announced herself to the stage. Hatty is not only the mastermind in charge of SWL, but also the show’s MC, and immediately dispelled any nerves and fatigue felt by the audience. Warm and funny, Hatty manages to make newbies feel completely at ease; as if it were their 10th visit to SWL. After a quick-fire quiz (prizes, of course, in chocolate form), Taylor Glenn took to the stage. We had the pleasure of meeting Taylor briefly before the show, and she is as energetic and delightful off-stage as she is on it. Smashing out her routine on some of the perils of motherhood, Americans, and how one of her daughter’s toys has become synonymous with the bedroom, the crowd were soon in hysterics – no really, they were – like dominoes, baby after baby yelled at the top of their lungs. No matter what you do to engineer your baby’s naptime, nothing will overcome their desire to unite with their fellow snot-monsters and scream as one. Nothing. Taylor was followed by funnyman Josh Howie. First off, Josh is hilarious. His rat-a-tat-tat observational style is endearing, allowing you to savour every punchline like a vintage Château Lafite. If you haven’t seen Josh before – go do it quickly. Yes, Josh was a crowd-pleaser, but none more so than his two-year-old daughter, Betsy. Josh took Betsy onto the stage with him, which was immediately met with a sea of ‘awwwws’. However, this quickly turned into fits of laughter as Betsy rammed Pom-bear after Pom-bear down his comic throat. The audience loved them, and there may be a new double act hitting your town soon! So a room filled with parents and babies. Is it loud? Yes, it can be. But what’s that famous phrase? ‘One noise is strident; ten sounds are peaceful’. Haven’t heard of it? No, nor us – we just made it up. But rest assured, at SWL, the tones of screaming babies blissfully blend to form soothing and harmonic background noise – no, that’s not true either. But this is what SWL is about. Amongst the laughter, and the tears, lies a community; an inclusive and caring environment where everyone is going through the same thing, having identical worries, and getting an equally disturbing lack of sleep. Yes, parenthood is about selflessness, being present and giving undying love and affirmation to your kids; but most of all, it’s a never-ending journey; and one which requires support. SWL provides an arena for that support, whilst supplying infectious laughter in the form of quick, engaging, and exceptionally witty jokes. If one act summed up SWL, it would be the moment where everyone, encouraged by Taylor Glenn, turned and reassured the person next to them, “don’t worry, you’re doing a good job”. So, get down to one of your local SWL events and have an amazing afternoon – you won’t regret it. And from all of us at bubble, you’re doing a great job.